Are You Prepared To Accept An Alien Intervention? How is it that people who have never had anything to do with aliens suddenly start asking questions? Questions such as "Are we prepared to accept them as our friends or maybe even as our saviors?" For many, the situation with regard to aliens is extremely confusing. It is anyway too hard to imagine that intelligent life forms may exist on countless other planets. Nowadays, if you notice a UFO, the big question is whether you're seeing a man-made object or a vehicle piloted by aliens. Then you come back to the warning issued by Wernher von Braun, shortly before his death, that the man-made ultimate threat to humanity would come from space and that this threat will ultimately unite the world in the New World Order. About three years before his death he came into contact with Dr. Carol Rosin and he told her that to justify the huge cost for the space weapons, the secret space fleet and to promote the agenda of the New World Order an artificial enemy would be created. At first the terrorists, than it would be Russia and now again the terrorists and ISIS and finally, the last card: A threat from space. This is nothing new, but people who have never had anything to do with aliens are now suddenly become aware of it. As Michael Snyder of The Economic Collapse Blog and The End of the American Dream who writes about all sorts of things, primarily economic, but certainly not about aliens, until now. In a recent article Michael says, "anywhere in the world you see articles appear that British scientists have suggested that life on earth could ever come from other planets and in the past, our planet has been in contact with extraterrestrials and that this is about to happen again." Furthermore, he asks whether we are prepared to accept that life here on earth originally came from other planets and if Jesus was extraterrestrial. For Michael Snyder, this is still all a bit of a shock and it is clear when you read his article, actually he not really believe it and prefer to stick to the things that are told in school and church. With each passing year, more people than ever are looking to the stars for the answers to the most important questions that we face. 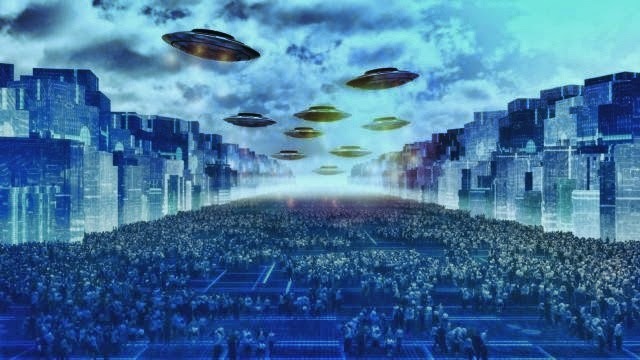 Thanks to a relentless bombardment from books, video games, movies and television shows, there are now hundreds of millions of people all around the globe that are anticipating that alien lifeforms could make contact with us at any moment. So are we being prepared to believe that extraterrestrials seeded life on this planet? Are we being prepared to accept them as our friends or even potentially as our “saviors”. Reasonable people, like attorney Michael Snyder who normally move in the financial world, are already so conditioned by all the news that they would find it not quite strange as tomorrow the government announces that aliens are real, they are our saviors and will help us to unify the world. When something like that happens, the big question remains whether we are dealing with a real alien intervention or a fake alien invasion as Carol Rosin describes in the video below. After our discussion, I think this sums it up nicely Ron! How could an alien life form possibly be able to take sides in any conflict on earth? These guys would not know how humans think or what really motivates them. The only thing they could do is try and take control for their own interests. Why would they even care about our species. I can't buy the space brotherhood bs. Why is it that you think that aliens, could not know or understand humans? What motivates them? The evidence is rather strong that aliens have been tied to our genetics, cultures, and history for 10s of thousands of years at least. That many civilizations worked With them, while others viewed them as gods, and Angels and djinn. I suspect you are thinking of aliens as a single species or sect, or organization with a specific or single unified agenda, rather than multitudes of species, with many organizations and orders with multiple goals and agendas each? You have likely lumped them into a single negative selfish common denominator. And while I suspect there are some races and organizations which would literally fit your view, i hope you are mature and advanced enough a thinker to understand that like our own species, there are complexities and differences among many aliens and their own multitude of cultures. "At a certain point you will come to realize that this New Revelation is here to give you a new life. It is not simply to make improvements or to sweeten it with a sense of spiritual meaning or to condone your thoughts and beliefs and past actions with some kind of blessing from above. At some point you will come to realize that the life you are living is really not appropriate for you. It is a compromise. And the compromise has been too great. It has been too thorough. It is a compromise with how you regard yourself, how you regard others, how you regard the world. And though this realization may be resisted, maybe it will be denied, and further compromises will be sought, in actuality it represents the beginning of a great hope for you. This realization, which is so denied and avoided, is the beginning of a greater promise for you. Do not resist it. Do not argue against it. Do not complain that you may have to make great changes in your life. Of course you will! Because you are being given a new life—not a slightly better rendition of your old life, not simply new scenery or new faces or new forms of stimulation. This is not a cosmetic change. This is a change of a far greater importance and depth and meaning for you. This is the kind of change your heart has been yearning for for so long For such a long time have you been laboring."